Dezeen has teamed up with architect Sam Jacob to give away five of his Citizen of Nowhere passport covers, which reference a comment made by UK prime minister Theresa May after the Brexit vote. This competition is now closed. Congratulations to the winners, which are: Annette​ ​Oliver from Derby, UK; Clio​ ​Zancanella from Paris, France; David Daplyn from London, UK; Karin​ ​Jaschke from Brighton, UK; and Martine​ ​Dawber from Wigan, UK. Jacob's design sees a dark-red cover emblazoned with the slogan "Citizen of Nowhere" and a globe symbol. The architect created the cover in response to the speech where May said: "If you believe you're a citizen of the world, then you're a citizen of nowhere". The statement was hugely controversial with those who voted to remain in the EU – and was described by one opposing politician as "quite evil". "The nationalist ideas that have surfaced with Brexit, Trump's America First and elsewhere seem regressive retreats from progressive internationalism," Jacob told Dezeen. "The Citizen of Nowhere passport holder is for all of us who think that being a citizen of the world is a good thing," he continued. "It's good that we recognise we are citizens of our own country and the world, and that these things aren't mutually exclusive." In the wake of Brexit, Dezeen organised an unofficial passport design competition to provoke people into thinking about what the UK's identity should be after it leaves the European Union. At the time, in an opinion piece for Dezeen, Jacob said he believed the design of a passport could "create new kinds of identity and citizenship". The winning design in the contest, by Scottish graphic designer Ian Macfarlane, featured a cover that transitioned between the burgundy of the current UK passport and the dark blue of the old, pre-EU British passport. Macfarlane's designs and the other shortlisted entries have been showcased at the Design Museum and the V&A, both in London. The Home Office is expected to announce who has officially won the contract for the new UK passport contract before Christmas 2017. However, controversially, the design could end up coming from a French or German company. 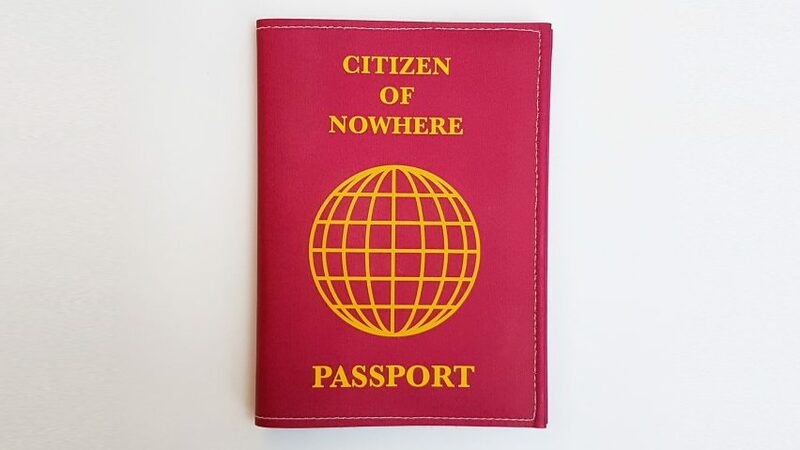 Five winners will each win a Citizen of Nowhere passport cover, which is also available to purchase from Jacob's website. "The design of a passport might create new kinds of identity and citizenship"
UK brings back blue passports to "restore national identity"